The 2019 Capitals Canine Calendar dropped this week, launching the Caps' most recent fundraiser to benefit our four-legged friends. If you're still looking for the perfect holiday gift for the sporty dog-lover in your life, you need not look fur-ther. WASHINGTON — It’s here: the pawsome event we’ve all been waiting for. 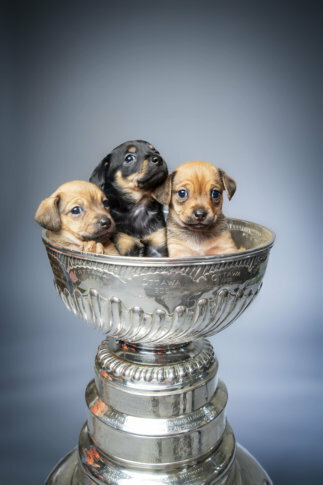 The 2019 Capitals Canine Calendar dropped this week, launching the Caps’ most recent fundraiser to benefit our four-legged friends. If you’re still looking for the perfect holiday gift for the sporty dog-lover in your life, you need not look further. The calendar available for purchase online or in limited supply at the team store and merchandise stands in the Capital One Arena. The cost is $20, and 100 percent of the proceeds benefit Homeward Trails Animal Rescue. Additional donations are appreciated. Homeward Trails is a nonprofit organization that offers pet adoption in Washington, D.C., Virginia and Maryland. They find permanent adoptive homes for dogs and cats from high-kill shelters, or whose owners can no longer care for them. The Capitals have raised nearly $250,000 for Homeward Trails through Canine Calendar sales since 2014. Now, without fur-ther ado, please enjoy this calendar sneak peek.